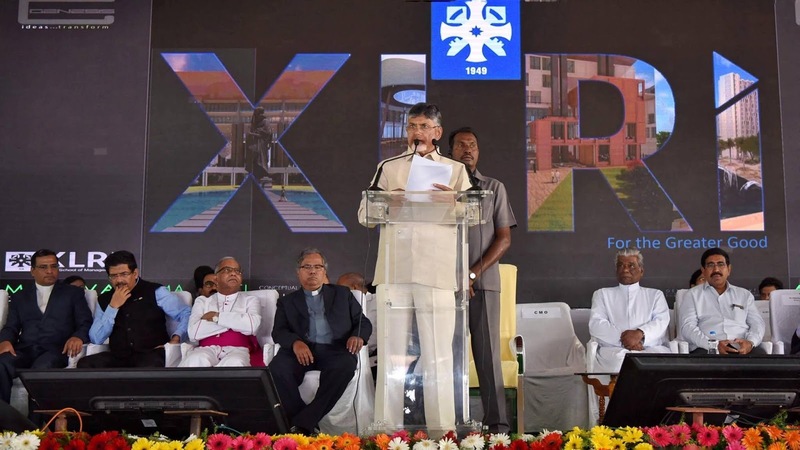 17th January, 2019: XLRI- Xavier School of Management, one of India’s premier B-Schools today laid the Foundation Stone for XLRI AMARAVATI - their new campus in Andhra Pradesh. At a formal function held today, the foundation stones of the new campus were laid by Sri Nara Chandra Babu Naidu, the Honorable Chief Minister of Andhra Pradesh; Fr. B. Chinnabathini D.D., Bishop of Guntur; Fr. T. Joseph Raja Rao, D.D., Bishop of Vijayawada; Fr. P.S. Amalraj, S.J., Provincial, Andhra Jesuit Province along with Fr. E. Abraham, S.J., Director, XLRI Jamshedpur; Fr. Jerome Cutinha, S.J., Dean- Administration & Finance, XLRI Jamshedpur; Dr. Ashis K Pani, Dean- Academics, XLRI Jamshedpur and Fr. K.S. Casimir, S.J., Chief Administrative Officer, XLRI Amaravati and other dignitaries. XLRI-Xavier School of Management, Jamshedpur is a premier, private management institute in India founded in 1949 by Fr Quinn Enright, S.J. in the ‘steel city’ of Jamshedpur (www.xlri.ac.in). Over the last six decades, the institute has grown into a top-ranking business management school of international repute with a wide portfolio of management programs and research publications. Its alumni are spread around the globe and have demonstrated responsible business leadership in their organizations. XLRI continually strives to contribute its mite to the professional growth and management of numerous organizations and institutions across industry sectors. XLRI has been awarded two prestigious International Accreditations, viz., AACSB - The Association to Advance Collegiate Schools of Business and AMBA - Association of MBAs. XLRI has also earned the National Board of Accreditation (NBA) accreditation.